Last month we discussed about how you can automatically forward Gmail to another email address of yours. This approach is working fine, but what if you want to forward only certain emails based on specific sender, subject or even messages that contain certain keywords? In this case, we can make use of the Filters feature in Gmail. Gmail Filters are used to automate all sorts of tasks for your incoming messages. This includes marking messages as read or important, auto deletes messages, labelling, forwarding and more. 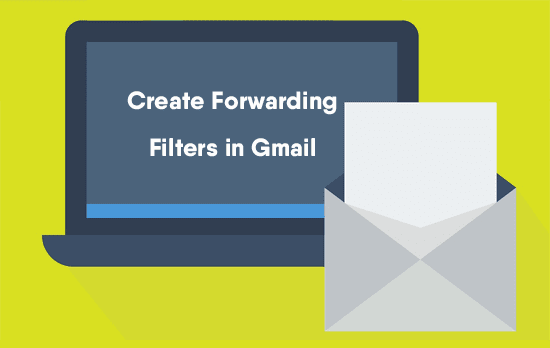 If you’re using Gmail and you haven’t known how to create forwarding filters, you may follow the steps provided below. Before you proceed, do note that you’ll need to add a forwarding address, as we will be using this email address to receive the forwarded email. 1. Launch the web browser of your choice and sign in to your Gmail account. 2. Click on the gear icon located at the top-right of your screen and choose Settings from the menu that appears. 3. Click on the Filters and Blocked Addresses tab on top and then clicking on the Create a new filter link. 4. The Filter Creation Form will then appear. There are multiple options available for you to fill out depending on the conditions you would like to set for the email filtering. From: Enter the sender email address that you would like to make a filter. For example, if you wish to forward all incoming messages from the sender with email address abc@abc.com, then just enter this email address. To: Set the filtering condition based on who the recipients of the email are. For example, if you wish to forward all incoming messages that contain Mike as a recipient, then enter Mike’s email address in this field. Subject: Email filtering will only be performed if it uses a specific subject line. Has the Words: Email filtering will only be done when the incoming message bodies contain the specified keywords. Doesn’t Have: This is opposite to the “Has the Words” above. Filtering will be done when the incoming message bodies do not contain the specified keywords. Size: Set the filter condition based on the email size. Has Attachment: Tick this option if you want to filter all incoming messages that has attachment file. Don’t Include Chat: Tick this option to exclude chat messages from the filtering. After filling out all the necessary filters, click on the Create Filter link at the bottom. 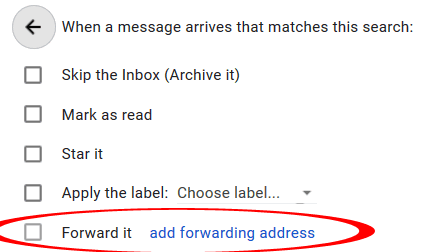 Then, check the Forward it checkbox, and select the forwarding email address that you’ve added. 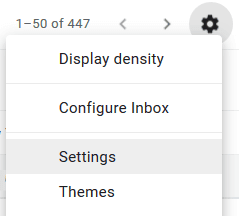 Lastly, click on the Create Filter button at the bottom to complete the forwarding filters in Gmail.